Sisters Rotana Farea, 23, and Tala Farea, 16, had been living in the United States for two to three years, and their bodies were found on the banks of New York's Hudson River on October 24. Police in New York searched on Tuesday for clues to what, or who killed two sisters whose bodies were found duct-taped together on the banks of the Hudson River in Manhattan. The Central Intelligence Agency (CIA) has fired Lulu, an adorable black Labrador, from a training programme after refusing to become a bomb-sniffing dog. A spike in Australians being attacked by flesh-eating bacteria has left health authorities puzzled and concerned. 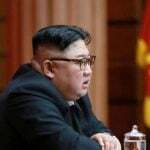 Prime Minister of Australia, Malcolm Turnbull, warned Wednesday that a conflict with North Korea would be “shattering,” as tensions between Washington and Pyongyang intensified.